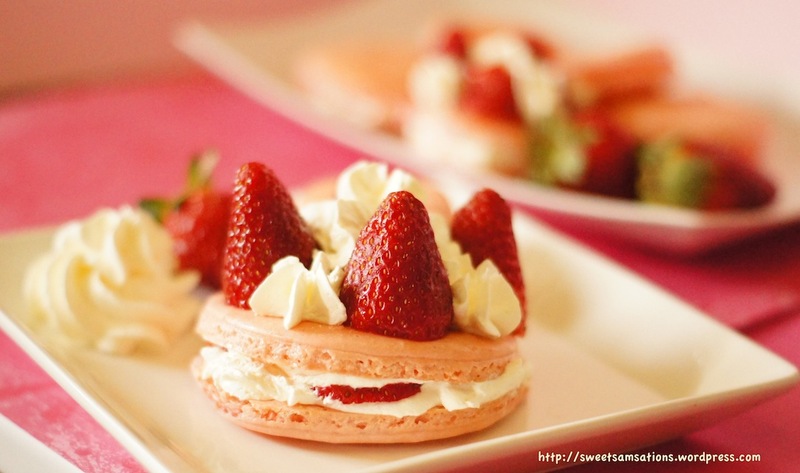 Did you know that March 20th is…… MACARON DAY?!?! 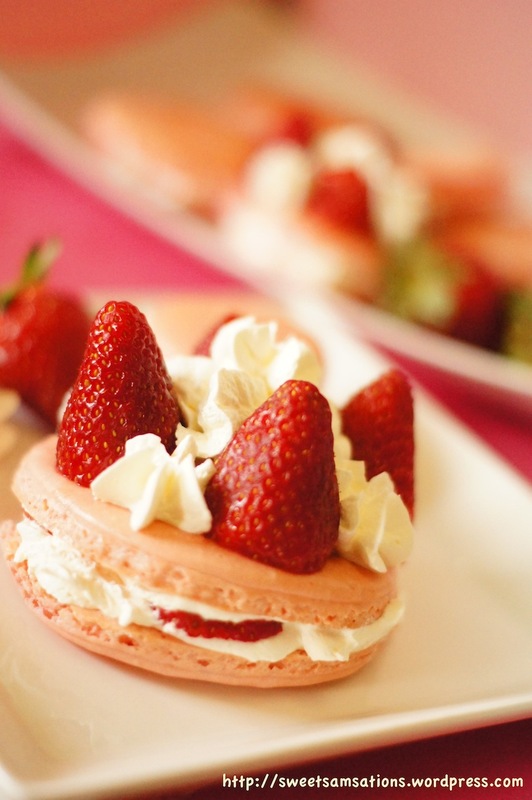 Vancouver for the first year celebrates Macaron Day! Bakeries will participate in form of donating part of their sale to charity, creating deals or even giving them out for FREE! Yayyyyyyy!! Please refer to the Vancouver Observer to find out more! I made the meringue cookie following a recipe from the book, but I decided to use whipped cream for the filling inside. Macaron shells are usually super sweet because of the high ratio of sugar for maintaining its structure. I didn’t think the addition of a super-sweet buttercream would be necessary! But, (non-traditional?) perhaps whipped cream would downplay its sweetness. But, I still didn’t get a weighing scale. I’m too used to measuring by volume now.. But hey! I don’t think I did too badly for myself. 😀 So, here is the list of ingredients by weight AND volume. I would encourage you to try it by weight if you have a scale! I am submitting this post to Aspiring Bakers #17 – March Macaron Madness! (Mar 2012) hosted by Alan of Travellingfoodies. make approximately 30 mini macarons / 20 medium-sized macarons / 7 giant macarons. Line your baking sheets with flat greaseproof paper. Parchment paper / silicon sheet OKAY. Wax paper NOT OKAY!!! Whisk the egg whites (at room temperature) to glossy firm peaks adding the caster sugar gradually. Sift ground almonds with the icing sugar and discard any large coarse pieces of ground almonds. Mix well to incorporate icing sugar and almonds. Work on the mixture using a plastic scraper. Press down well with the scraper, going back and forward, to remove oxygen (potential air bubbles) from the whites. Do this for no more than 5 minutes until you have a smooth mixture. The result should form a soft and brilliant mixture than forms a “ribbon” on the scraper. If the mixture is too liquid, the macarons will be flat. If too stodgy, they may crack. Transfer the mixture to a piping bag with a plain nozzle (1cm round the tip). Twist or clip the bag above the nozzle to stop the mixture from escaping. Pipe out the desired size of rounds. (about 3cm in diameter for medium ones). Press the nozzle right down on the paper then finish off with a flourish to obtain a nice round. Leave a good space between each round as they really do spread out! Leave for about 30 minutes to set until they feel hard. Meanwhile, preheat oven to 160C / 325F degrees. Bake in the centre of the oven for about 10 – 12 minutes. Giant macarons will require about 15 minutes. Test after 8 minutes. Touch the top of a macaron. If there is a “wobble”, cook for 3-4 minutes longer till firm. When ready, leave them to cool off completely then scrap them off with a palette knife. I didn’t really follow any recipe for this. I think 1 tbsp is sweet enough! But some may enjoy half or double the sugar of my preference! P.S. This will probably be more than enough whipped cream you need. You might even want to consider halving it. In chilled bowl, whip the whipping cream with an electric mixer at high speed until soft peaks begin to form. Add the sugar and vanilla, whipping just until stiff peaks form. Do not overbeat, or cream will later separate when sitting. Presto!! Now place creme chantilly in a piping bag and pipe them onto one side of each macaron. You may also want to add some sliced strawberries in! mmm… Marry a filled and unfilled shell together. Conclusion? I didn’t think my macarons were perfect. I found them a little flatter than I wanted. Some cracked a little too.. But nevertheless, they tasted great!!! I really like the macaron / whipped cream combination!! Sweet but not too nauseatingly sweet! WOW.. I don’t know what else to say about this beautiful dessert. I can eat these macaroons any day of the week and still not tire of them. You did such a great job with this. Thank you Kay!! Yay on fellow macaron fan!! hehe..
Oh Sam! You’re macarons look delightful! I love macarons, I love all the different flavor combinations, you can do anything with them! I think I will post the ones I just made to that site as well. 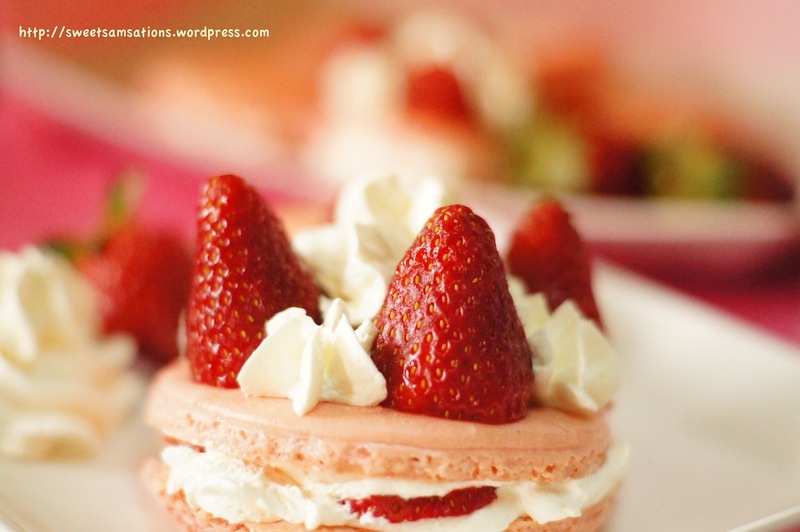 I wish I could taste yours, I love the idea of the chantilly cream with strawberries. YUM! These macarons are super duper gorgeous and delicious looking Sam. These look like something that would be served in a restaurant. High-five to you for a job excellently done! These are gorgeous! I love the creme chantillly. These were so so so so so so so so so yummy BB. Thank you for sharing! Almost like meringues with an extra punch of delicious fruit. This is certainly the best macaron version I had ever seen. Just look at that beauty! Awww! That’s such a sweet comment!! Thank you Raymund!!! These look refreshing and delicious! Thank you CCU!! hehe.. It’s my first time trying to make macs! Definitely won’t be my last! Thank you Maureen!! I’m glad they turned out okay.. Not all of them got out fine though! hahaha..
Lovely, lovely presentation and photos. Your instructions are so clear and easy to understand and follow. Thanks for sharing. Did not know there is a macarons day. learn something new, thanks. Yeah! This was something new for me too..!! Thank you Norma!! Wish I’d know about macaron day – I surely would’ve done my part to celebrate, too. Yours look fabulous! Looks beautiful! So pretty with the berries, and delicious! Thank you Carol! Berries add a magic touch to everything! haha..
Aww! Thank you Bam!! I hope you enjoy it here! Yes, sometimes I spend way too much time and money for my own good! hehe.. Oh wells, life would be so dull without the joy of eating! This is a beauty – celebratory enough for the day. Love the creme chantilly and berries with it. So spring! So welcoming! Thanks Claudia! I can’t wait for summer! I don’t know if we can still call is spring here in Vancouver because it just snowed today… again.. hahaha.. But I’m starting to see the price of berries decrease! so yayy! This looks wonderful! You have done such a fantastic job with this dessert. Superb!!! Thanks Asmita! And welcome back from your vacation! Most definitely! I’m surprised that macarons weren’t heard of only until recently! They’re so delightful and pretty!! I’d love to have them all the time tooo..! oooh! lol.. Interesting! i guess accurate measurements are imperative to the success of baking!! I was considering the dollar store. haha.. But I guess that won’t cut it! Thank you!!! That is true!! Sometimes I can find it a little too sweet though but I guess there’s just a magic behind this dessert! What a genius Ladurée was in redefining these little meringue cookies!! Those are so pretty-in-pink adorable! And delicious…I love all things strawberry flavored. When I first saw the title, I was imagining coconut macaroons. These French beauties are just spectacular! 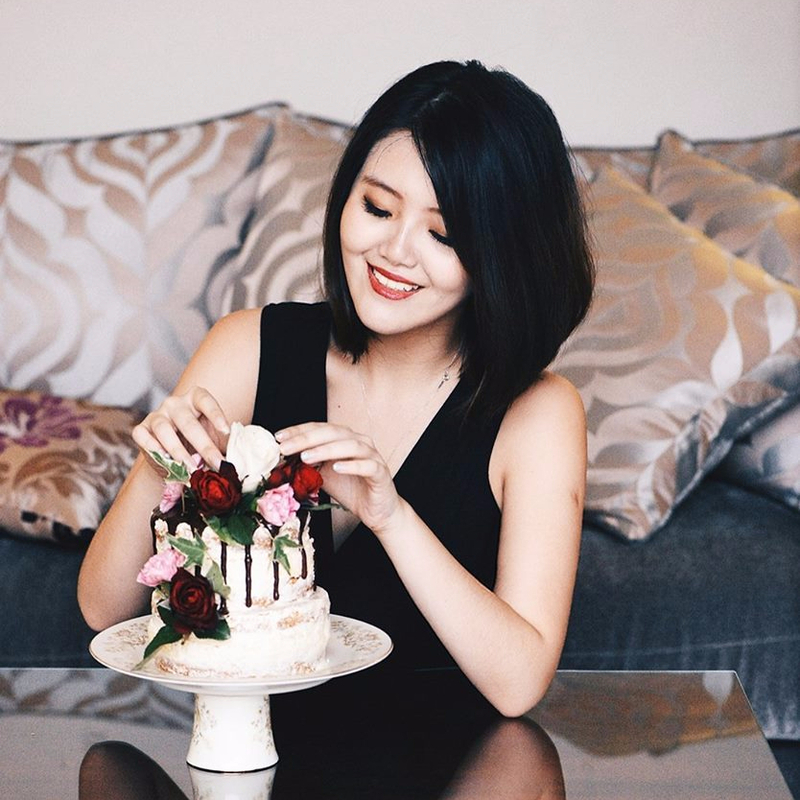 I love how you challenge yourself with different types of baking. Bravo, Sam! hehe.. I love the coconut macaroons too!! It’s on my to-bake list. 😀 Yes that list is not getting any shorter… lol! Thank you!!!! I’ve always wanted to try macarons; kudos to you for actually doing it! I do think you should get a digital scale, though — it’s SOOO much better for baking. Hi Jen!! Thank you for visiting my blog and thanks for your sweet comment!!! 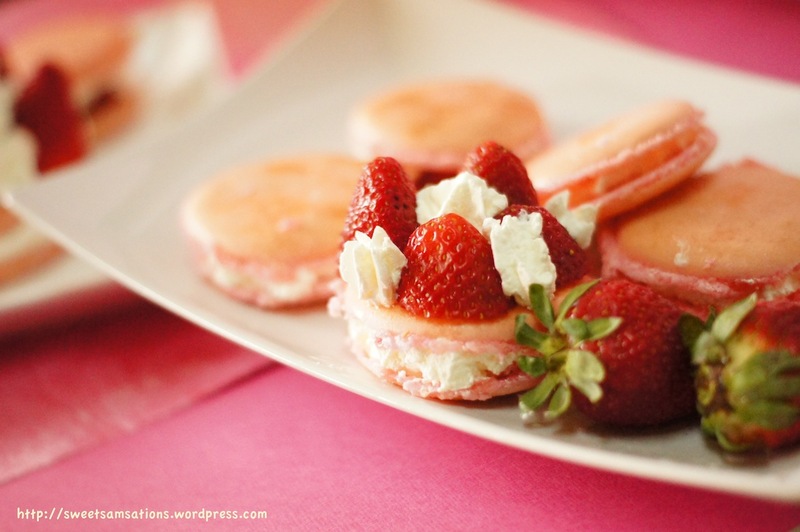 Look at that generous amount of cream and strawberries in each macaron! Yum! BEAUTIFUL Sammie!! I tried making these twice, but the legs still wouldn’t stand up as tall as I would have liked them to. So maybe I will have to try them again. You did a nice job!! The strawberries topping give the mac a whole new dimenstion. LOVELY! Thank you Lucy!!! Glad you fancied it!